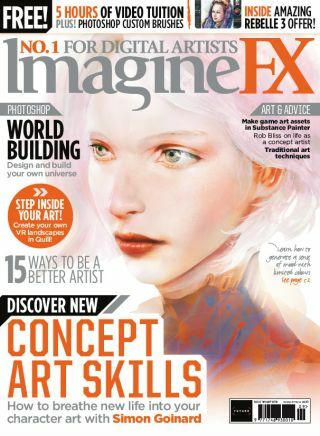 +$Take a peek inside the latest issue of ImagineFX magazine – out now! +$Find a fresh perspective on creating concept art and breathe new life into your character designs with the latest issue of ImagineFX magazine – on sale today. Inside the pages of issue 164 you'll learn how the experts create polished character designs, plus we hear how they get their work out there and make a good first impression with studios. +$Elsewhere in issue 164 we pick up portrait tips from Simon Goinard, who reveals how he uses light to depict volume and shapes. We also catch up with Mark White to hear how you can use Photoshop to blend and mix colours to take your work to the next level. +$And of course, we also fill you in with the latest digital art news, review the latest software you need to check out, and showcase the amazing artwork sent in by you, our readers. You won't want to miss it! +$It's a dilemma faced by many designers: do you stick with the stability of studio life or take a risk and go freelance, and possibly lead a happier career in the process? To help you see both sides of the debate, we spoke to artists from various walks of life to discover the pros and cons of each option. +$With a career including credits such as 2000AD and the Harry Potter films, it's fair to say that Rob Bliss has found a way past the industry gatekeepers. It wasn't always the way though. For many years he was beating his head against the wall, trying to find a way in. In this interview, Rob reveals his road to success. +$When it comes to designing a fictional world with your art, there is no end of things to keep in mind. In this tutorial, artist Anthony Macbain shares over a decade of video game industry experience to help you create believable worlds with the power of illustration. +$Trying new techniques is the secret to growing as an artist. With that in mind, artist Sophie Klesen shares how she enhances her watercolour paintings with the application of gold and sterling silver leaf. And with the help of this tutorial, you'll be able to give it a go, too. +$When it comes to the establishing a creative workflow, artist Eddie Del Rio reveals that there isn't just one process. Instead, he relies on a toolbox of techniques that help to save time and create a steady flow of ideas. In this workshop, Eddie shares 15 processes that could help spark your creativity.